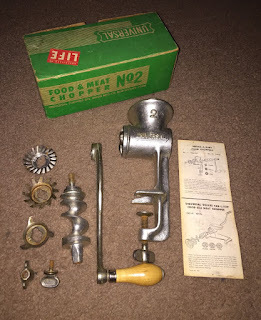 I was in the mood for meatloaf after receiving my vintage Universal Chopper and my mind was immediately drawn to the movie "A Christmas Story" where the family is seen eating the same dinner every night, namely meatloaf, mashed potatoes and braised red cabbage. So what better way to break in my new kitchen gadget than by recreating that dinner. Note that in the movie, I don't believe gravy was ever used with the meatloaf and potatoes but I included the Spanish Sauce recipe which you can make if you wish. Most of the recipes I've written about before so today will will touch on the Braised Red Cabbage. This recipe comes from a Hungarian Cookbook in my collection and is one that will be familiar to anyone from an Austro-Hungarian or Bavarian background. It's simple, cheap and you only need save your bacon drippings (you do save bacon drippings don't you?) If you don't happen to have bacon drippings then use some diced bacon instead. Keep in mind this is not the soupy, limp, boiled cabbage as seen in the movie but a much more flavorful version that would have been popular in Indiana among the Germans and Hungarians during that time period. Melt the fat over med-high heat and add onion, cooking 3 mins until transparent. Add all ingredients except cabbage and stir well cooking 5 mins. Add shredded cabbage and mix well. Reduce heat and simmer 1 hour stirring occasionally. Add water in 1/4C increments if needed during cooking.